Rs.700 for the ticket, Rs.600 for the nachos, Rs.350 for the popcorn and Rs. 250 for the slushy. I just spent around Rs.2000 for one movie. And if you ask me was it worth it? Yes! it totally was. A full-time entertainer, a family movie which has all the elements to stir laughter, romance, and anger. After a very long time in fact after almost a year, our entire family planned a movie night and went to the cinema to watch a movie. Although there were many new releases during Eid, none had the strong magnetic effect of actually being able to pull an audience to the movie. And more so an audience which has Netflix in their own bedroom where they can watch the worlds best productions and all at a very low price. Cheaper snacks, the comfort of your bed, and outstanding performance by artists. In other words, I also have apprehensions for the revival of the Pakistani cinema in the Netflix era. Especially now that Indian productions have also carved their way into Netflix through Sacred Games. But despite all these doubts we went to watch Teefa in Trouble. And I am so glad we did. 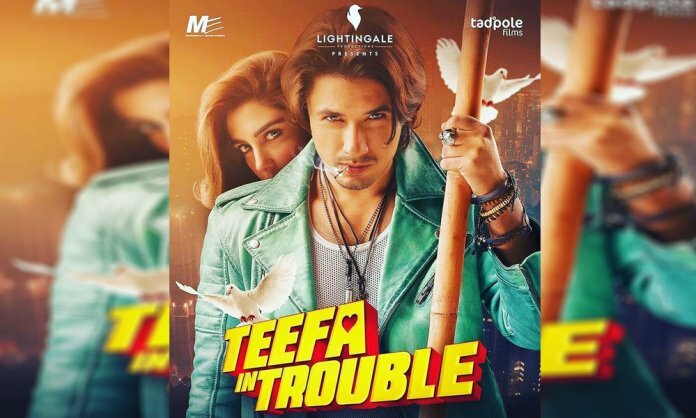 Teefa in Trouble is not a new story, in fact, its very cliched and we all know what will happen next how the characters will react the beauty of it is that all the cliches are portrayed in a very beautiful Pakistani way. Which I think is the USP of the movie. Although there were many movies in the past like Ho Man Jahan, Cake or 7 Din Mohabbat in, the trailers displayed them like an elongated drama movie. When I go to the cinema I go for entertainment, it may sound cheesy but that’s the reasons why Avengers, Mission Impossible, Fast and Furious always have a houseful. So if a movie is going to make me think or depressed or question my civil rights I would rather watch it at home in the comfort of my bed. And this is exactly where Ali Zeefar scored it right with catchy songs, beautiful locations, big sceneries, nice dances, excellent music and one cannot forget the stunning Maya Ali. Who so far has done one of the best actings amongst many Pakistani female actresses. As an audience when you are sitting in front of the screen, the actors are supposed to send a chill down your spine and that’s exactly what she did. She looked beautiful so hats off the makeup artists and stylists, she danced really well and delivered her dialogues profoundly. Ali Zafar, of course, is one of Pakistans best asset and he delivered eloquently in the movie. But besides the lead roles all the other actors did a remarkable job, for example, Faisal Qureshi’s comedy timing was seamless and we surely want to see more of his work in the future. Javed Sheikh Mehmood Aslam and all the crew were perfect in their roles. When it comes to claiming Teefa in Trouble as a family movie yes it was apart from a few adult relevant jokes which only the adults will grasp the movie is clean and fun. The overall representation of the contemporary Pakistani youth is very much spot on and that’s why we all loved it.